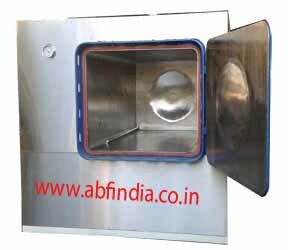 Horizontal Rectangular Autoclave have inner chamber of Stainless Steel, Boiler, Lid and Jacket - all made of 304 grade stainless Steel, outer chamber of thick gauge mild steel. For controlling sterilization cycle, a three way valve or a multiport valve - made of S.S. is provided. It is supplied complete with vacuum breaker, water level indicator, steam trap and automatic pressure control switch. The whole unit is mounted on a robust tubular stand. It is available in the following standard sizes. Operatable on 3 Phases, 440 Volts A.C. Supply. Single Phase optional on request. In case of GMP complete S.S ( Material of Construction ). Double door Autoclave Sterilizer, flush mounting with door interlocking systems.